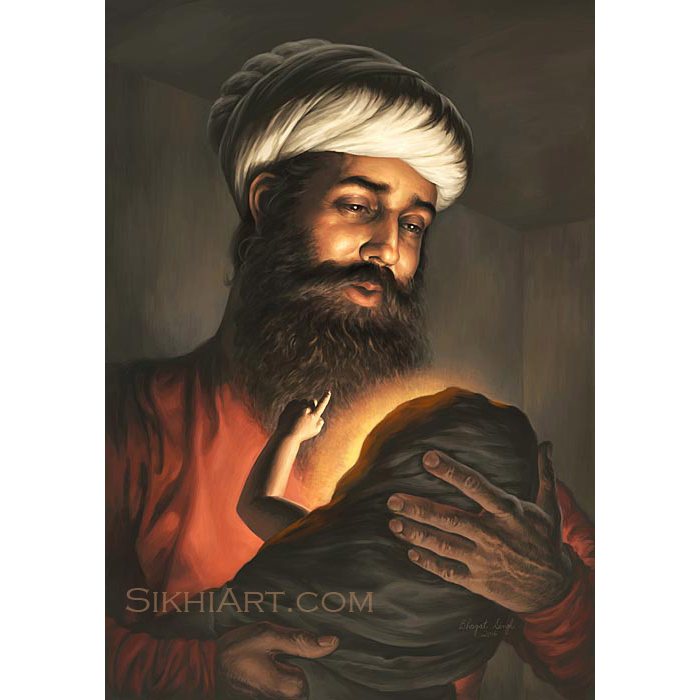 My newest painting depicting Dashmesh Pita – Guru Gobind Singh ji – is a reminder that through the Guru’s teachings we can illuminate the darkness in the mind. 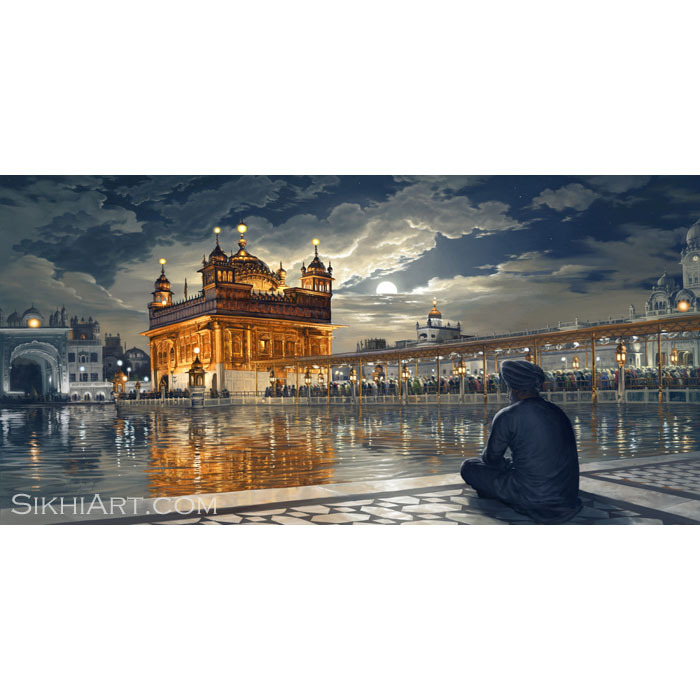 In this painting, Dashmesh Pita reflects Akal Purakh’s light, the way the moon reflects the sun, and when we bathe in Guru Sahib’s warmth, we become warm ourselves. Burn attachment to persons and materials and let this be your ink, let your intelligent mind be the paper. Let love be the pen, let one-pointed consciousness be the scribe, and then ask the Guru for his wisdom and write down what he says. 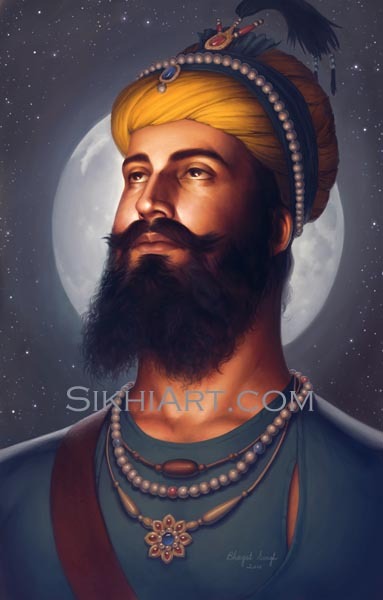 Ram is that force that animates everything, He is the supreme consciousness, Akal Purakh, and it is through consciousness that we know consciousness and it is through consciousness that we know the moon and the stars, the physical, conceptual and spiritual forms. 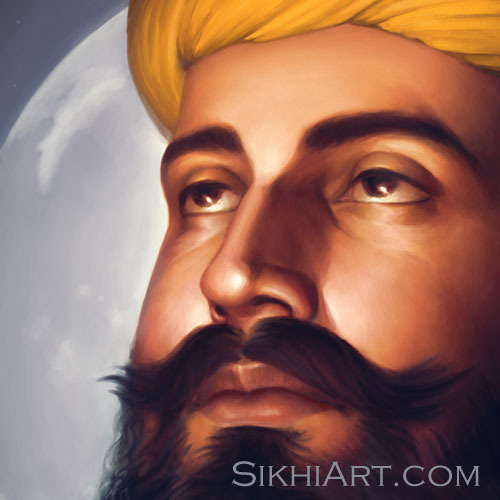 A Guru is someone who brings that consciousness to a higher level. 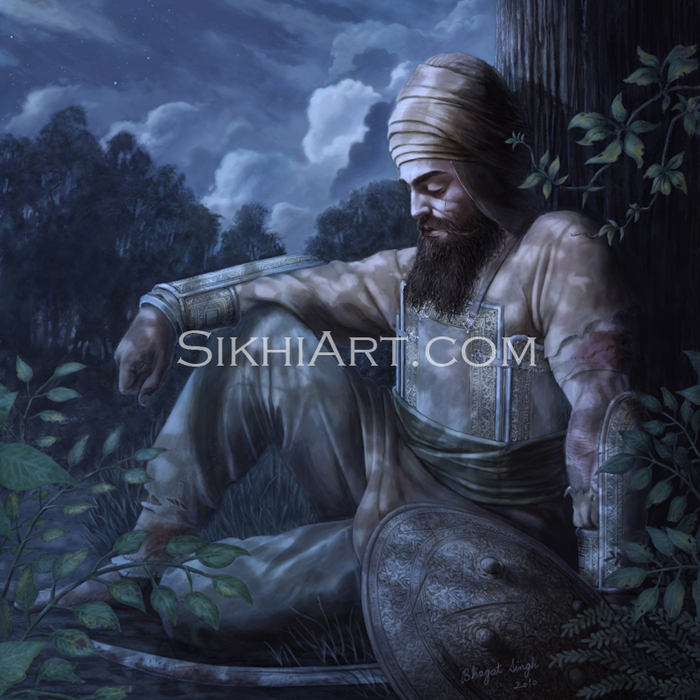 Guru Sahib charges up our cold dim light into an intense bright light; he empowers us. He teaches us how to become receptive to the supreme consciousness so that we learn to see it inside. When we become receptive to Ram, we see Him inside us, and when we see Ram inside, we can’t help but feel immense bliss and we call out His name again and again. 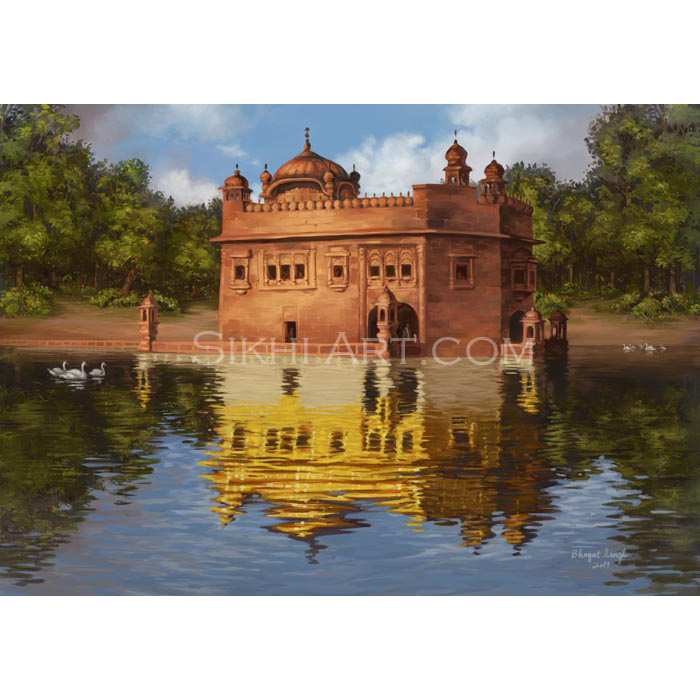 These teachings are embedded into the painting in symbolic representations. 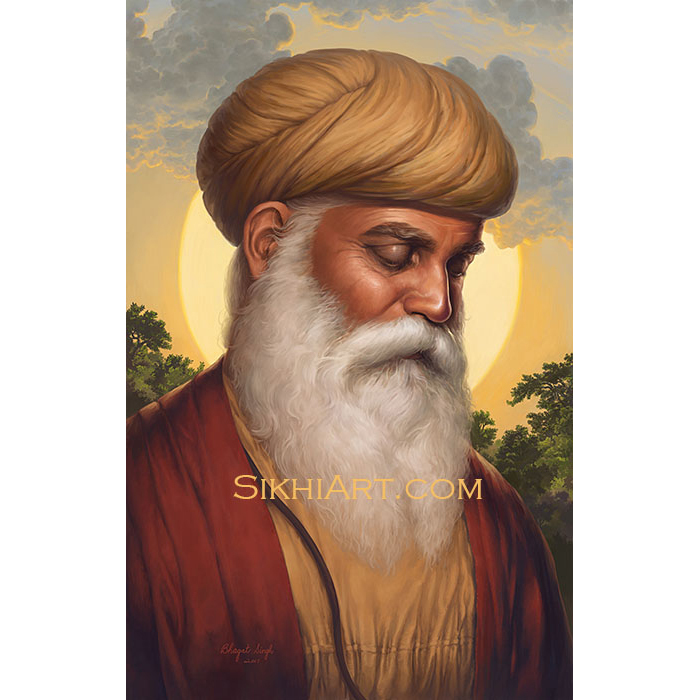 Perhaps that’s why this painting is huge – it is seven feet tall – or perhaps Guru Sahib’s larger than life personality requires a larger than life portrait! This is a puratan dumalla. 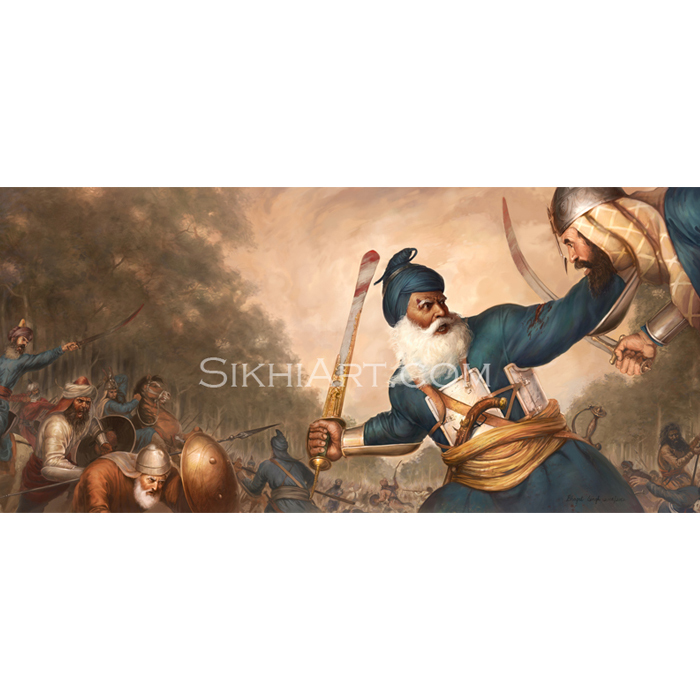 At that time, sikhs tied dumalla very differently from how we tie dumalla nowadays. 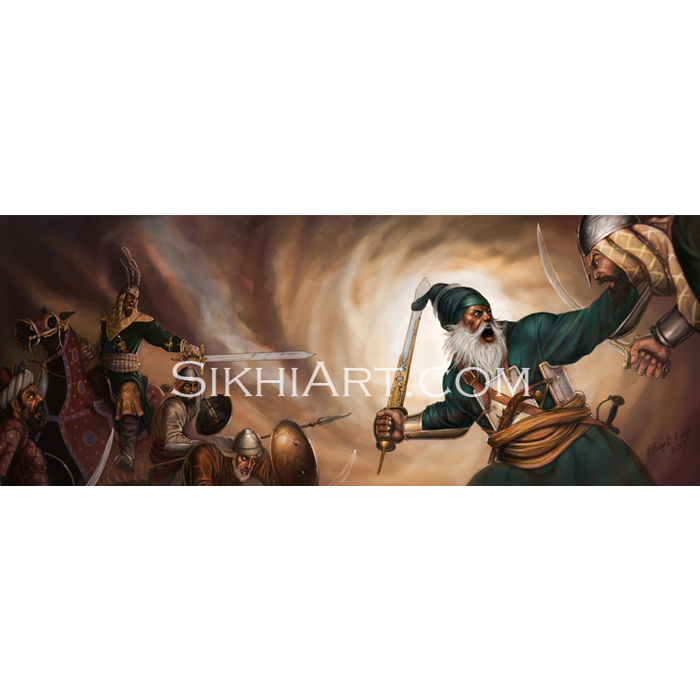 The slanted wraps were common in turbans during Guru Sahib’s time. Think of dumalla as an organism that has evolved over many centuries. 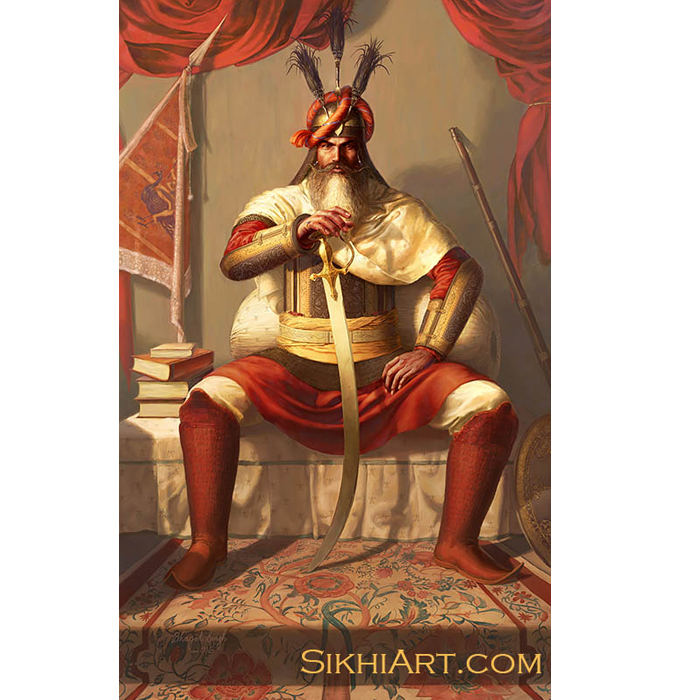 The earliest form of the dumalla was worn by our gurus and this dumalla then evolved during the period of Sikh Raj and British Raj into what it is today. Due to centuries of evolution, the earliest form of dumalla looks nothing like the modern one. 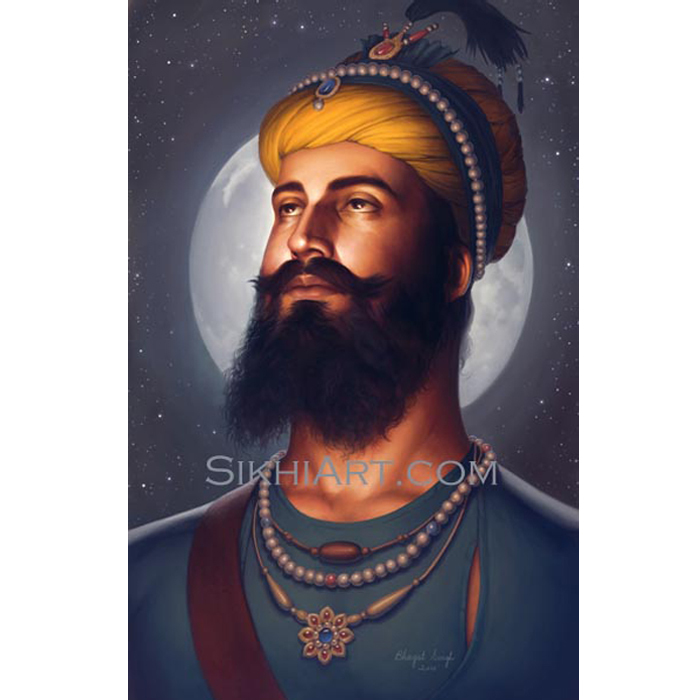 The King of Kings, Guru Sahib wears jewelry similar to other Mughal and Rajput kings of his time. 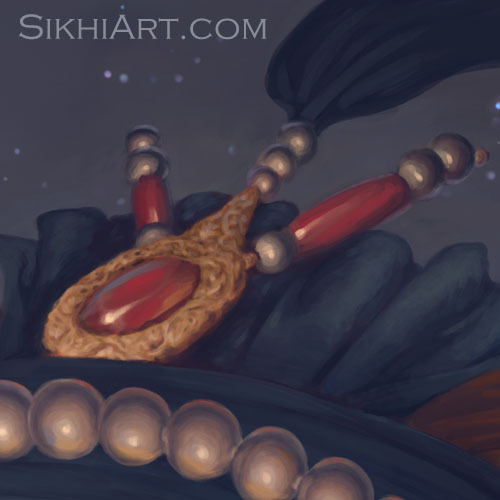 He has a goldeng kalgi with red and white pearls, and a heron’s plume embedded with more pearls. 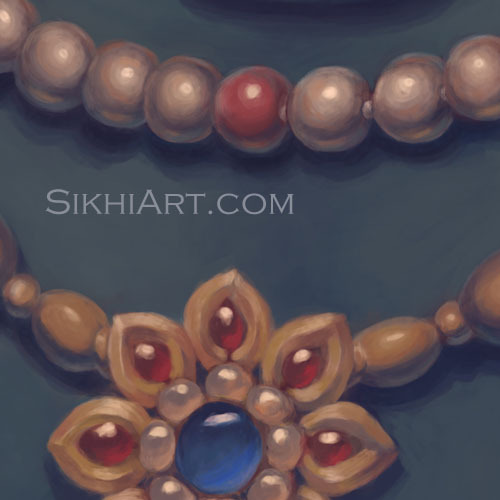 He wears different necklaces made of pearls, gold and expensive stones. I have sent you an email. Check your inbox Mandip.